The hotel has 77 rooms, 58 hotel rooms (Standart, Medium and Superior), 18 rooms of luxury "(Junior Suite, Suite and Superior Suite) and 1 suite. Comfortable rooms are furnished with soft furnishings, each decorated in its own style. The rooms deluxe and suites in addition to a Jacuzzi, plasma TV and DVD player. Located in the heart of the resort next to the highway, near the lifts Jardin Alpin, Verdons Chenus and two steps away from the central stores. One of the best hotels at the resort. Due to high quality care and excellent service recommended demanding and discerning customers. In the wellness center - heated pool, jacuzzi, sauna, steam bath, massage (wellness and medical massage), fitness room. The Centre also offers a chiropractor and a cosmetologist. There is also a games room with customers' card-table, pool table, evening entertainment. Restaurant "Le Saint Nicolas" offers fine French cuisine (there are always fresh Breton oysters and baked goods). Open only at night. The restaurant "La Table du Lana" overlooking the forest and terrace on the south side is covered with a buffet. In addition to the restaurants in the hotel has a piano bar. The hotel offers a fitness center: massage, jacuzzi, Turkish bath. Equipped children's playroom with board games, soft toys, computer games, comic books. 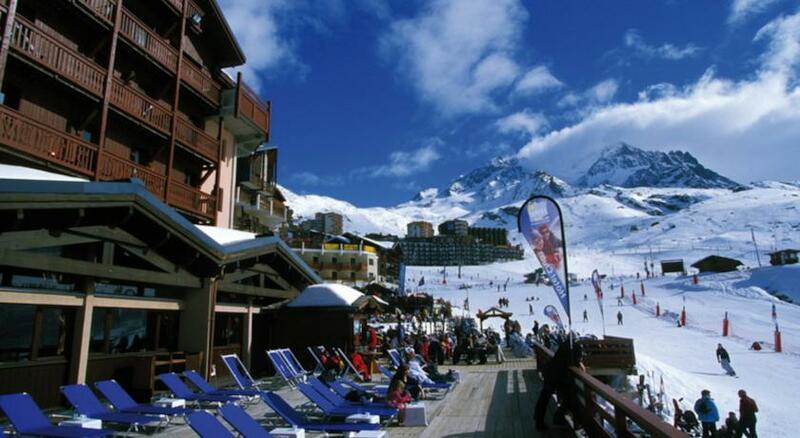 Located in a quiet part of the resort of Courchevel 1850, on a hillside Du Midi. La Sivoliere - small chalet hotel, like a fairy-tale cottage nestled among the pine forests. Was opened in December 2004. Among the 15 premier hotels in the resort. The hotel is decorated in mountain style. The interior is dominated by natural materials - wood and local stone. The hotel has 27 single rooms, 13 suites, 2 apartments first class. Junior room (15 sqm) - dbl bed or twin, bathroom with tub and shower. Comfort room (about 23 square meters) - a small living room, dbl bed, or twin, bathroom with bath or shower. Comfort Luxe room (about 30 sq.. M) - a small living room, dbl bed, or twin, bathroom with bath or shower. Junior Suite room (35 sqm) - a small living room, dbl bed, or twin, bathroom with bath or shower. Sivoliere room (30 sqm) - lined with wood room with a bed, dbl, bathroom with tub. Tourelle room (about 45 sq ft.) - A small living room with fireplace, a bunk bed, bedroom with king-size bed or twin, bathroom with Jacuzzi and shower with massage nozzles. Suite (about 44 sqm) - bedroom with dbl or twin, separate living room with TV (extra bed), bathroom with Jacuzzi and shower with massage nozzles. Suite Comfort (about 64 sq ft.) - 2 bed rooms with dbl or twin, 2 bathrooms (one - with a jacuzzi, the other - with shower). Suite Luxe (about 68 sqm) - 2 bed rooms with dbl or twin, 2 bathrooms with Jacuzzi. Suite Grand Luxe (90 sq.m.) - 2 bed rooms with dbl or twin, separate living room with fireplace, kitchen, 2 bathrooms with Jacuzzi and shower, terrace (35 sqm). Apartment Duplex (145 sq. m..) - 3 bed rooms with dbl or twin, spacious living room with fireplace, kitchen, 2 bathrooms with Jacuzzi and shower. Guests can relax in one of the salons in: fire hall, table games (cards, chess), a reading room (the library). 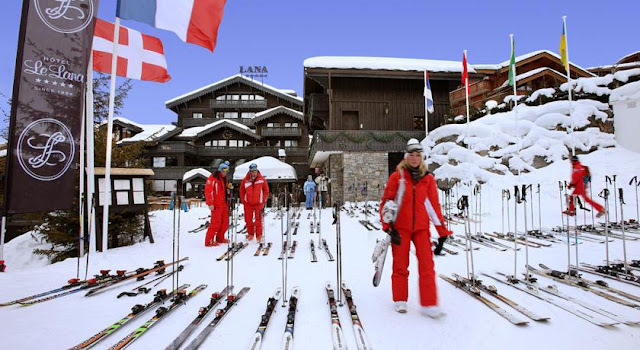 There is a ski storage room, you can use the services of a ski instructor. Located on the slope Bellecote, the legendary Courchevel 1850 resort, the hotel Des Neiges welcomes you to experience the atmosphere of pleasure and comfort. 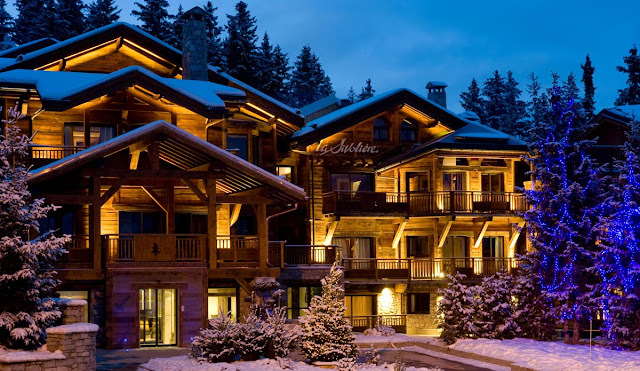 This charming hotel, established in 1953, first in the category of 4 stars in Courchevel, successfully develops the tradition of receiving guests, and does so with grace. This intimate and distinctive atmosphere will win you a warm welcome, personalized service and attention to detail. A spacious terrace facing south, refined and delicate cuisine, enchanting SPA, a cozy living room - all of these magical places will make your stay unforgettable. 48 rooms, some with a balcony, decorated in an elegant and refined style and equipped with first-class equipment. From each of the rooms offer stunning views. Interiors of the rooms are updated annually, creating a feeling of coziness, comfort and romance. Non Classique area 18-20 sq.m. located at 2, 4, 5 and 6 floors. Go to the north and west with views across the valley. Each room has a bathroom with bath or shower and toilet, combined or separate. Comfort rooms are 21 square - 25 sq.m., facing all directions, located at 2, 4, 5 and 6 floors. In all rooms - bathroom with tub and toilet, combined or separate. Many of the rooms have balconies and some are reported with numbers Superieure. Class rooms Grand Confort area of 28 square meters, overlooking the east, located on 2, 3, 4, 5 and 6 floors. In the bright and spacious rooms provide a peaceful atmosphere, located to the absolute rest. Each room has a balcony, bathroom with tub and toilet, combined or separate. Some numbers are reported with numbers Superieure. Non-class area of 29-35 sq.m. Superieure decorated in warm colors create a feeling of gentle harmonies. Located on all floors and go, by choice, on all sides, they are equipped with bathroom and toilet, combined or separate. Several rooms have balconies and some are reported with numbers Confort, Grand Confort and Luxe. Non-class Luxe, offering a more comfortable level of living, area 42 - 48 sq.m, are highly attractive and traditional elegance. Located at 2, 5i 6 floors, they face south or east and consist of both bedroom and living room. Each room has a bathroom with tub and toilet, combined or separate. Some rooms can communicate with the numbers Superieure. Suite area of 69 sq. m. - Now the kingdom of prosperity - offers even more opportunities for full relaxation, the hotel Des Neiges, where every detail is the subject of special attention. Located at the slope on the 2 floor, it consists of 2 bedrooms, 2 bathrooms and a living room. telephone, free wireless Internet, satellite TV, LCD TV and DVD-player, safe, hair dryer. Orient SPA-center invites you to visit a massage parlor - a real peaceful haven where not want to leave. In this very relaxed atmosphere, relaxing or sports massages will give you good health and help restore their strength. Restaurant L "Orchidee welcomes you to visit the elegantly decorated bright room with large windows to discover the delicious, inventive and light French cuisine: a harmonious symphony of flavors. Restaurant L'Orchidee remains true to the culinary traditions of the region and invites every week night in Savoyard style.